Bert Sutcliffe enjoyed some of his best cricketing days in India. The outstanding New Zealand post-War batsman played 9 Tests in the country, scoring 885 runs at 68.07 with three hundreds. The blonde left-hander batted against some of the very best spinners ever produced by India, starting with Ghulam Ahmed, Vinoo Mankad and Subhash Gupte in 1955 and ending with Srinivas Venkataraghavan and Bhagwat Chandrasekhar 10 years later. Sutcliffe succeeded to an extent in the third Test at Feroz Shah Kotla in 1955, scoring 230 unbeaten runs. 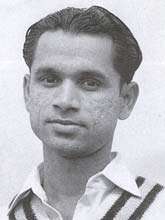 The pencil-thin Bapu Nadkarni bowled 54 wicketless overs for 132 runs on his debut. There was some consolation for this left handed all-rounder, who came in at No 7 and scored an unbeaten 68 while adding 123 with Vijay Manjrekar in the tall-scoring draw. Ten years later, in his last Test in India, Sutcliffe scored 54 in the second innings as Venkat bowled India to a win on the same ground. By then Nadkarni had perfected his art of agonising accuracy. According to H Natarajan, writing for ESPNCricinfo, the scoring options against his left-arm spin were “nil and negligible”. Nadkarni’s figures in the match read 16-8-21-0 and 19-13-10-0. No wonder the exploits of the left-armer filtered through Sutcliffe’s memories after all those years. Another great batsman who remembered him well into the 20th century was the famed Neil Harvey. “He was so accurate,” recalled the man who was the backbone of the Australian batting in the 1950s. Nadkarni did precious little in the epic Kanpur Test of 1959-60 when Jasu Patel bowled India to victory, but found himself shouldering huge burden in the next match at Bombay. Polly Umrigar was suffering from a bad back. Salim Durani, who had come into the side after Patel had fallen sick on the morning of the match, could not bowl due to a cut finger. The Australians, wary of Nadkarni’s reputation, decided to upset his rhythm by attacking him from the start. Harvey and Norman O’Neill succeeded for a while, but soon the plan back-fired. The spinner finished with 6 for 105 from 51 overs. It is interesting, given Nadkarni’s left-arm orthodox spin, that two superb southpaw batsmen of his era confessed to find it difficult to score against him. Even when Garry Sobers was in his prime form, hitting 142 at Brabourne Stadium in 1958-59, Nadkarni had not been mastered. His figures in the match had been 2 for 69 from 36.1 overs. However, right-handers suffered as well. Batting against Nadkarni often resembled wading through multiple identical eternities, passing over after over of stagnation, without the scoreboard registering a tick. Ken Barrington and Brian Bolus had been part of a period of scorelessness that borders on ridiculousness. Nadkarni was the Ebenezer Scrooge of bowlers, tight-fisted to the point of a sordid skinflint. His economy of 1.67 runs per over ranks second only to the notoriously stingy Trevor Goddard’s 1.64 among bowlers with more than 30 wickets, or at least 3000 balls bowled in Test cricket — whichever way one chooses to look at it. In the modern-day bashball of Twenty20 and IPL, he would have been the dream catch of any team — especially because he was also a handy batsman lower down the order. When the situation demanded, he could give the ball an enterprising whack, and averaged over forty in First-Class cricket. Off his own bowling he was a fantastic fielder and his brilliance continued when he took up position, generally close on the leg side behind the wicket, when the bowler at the other end ran in. Born in Nasik, Nadkarni initially turned out for Maharashtra in Ranji Trophy. It was in the 1960s when, as an established Test star, he was recruited by the glamour boys of Indian cricket and started representing Bombay. In his initial days, he was more of a batting all-rounder, and got his big break when Vinoo Mankad rested himself for the Delhi Test against New Zealand in 1955-56. However, when the great Indian all-rounder returned, the younger man found himself out of the side. As a rather poor consolation, he was made the captain of Maharashtra that season. It was during the rather forgettable Indian tour of England in 1958 that Nadkarni proved his worth as a bowler of unerring line and length. He played four of the five Tests, sending in endless accurate overs, and provided glimpses of his batting prowess. After a couple of gutsy knocks at Manchester, when India tried to chase down an impossible victory target, Nadkarni was asked to bat at number four against the rampaging duo of Fred Trueman and Brian Statham in the final Test at The Oval. The batsman in him obliged with a fighting 76 in the second innings, top-scoring for India by quite some distance. Nadkarni famously polished his skills of accuracy at the nets, pitching relentlessly on a coin placed on the wicket. The first phenomenal evidence of his parsimony was demonstrated against Pakistan in the drawn series of 1960-61. In the first innings at Kanpur, he finished with figures of 32-24-23-0. And in the last Test at Delhi, he extended it to the realms of eternal standstill with 34-24-24-1 and 54-38-43-4. In West Indies, he was his gutsy self with the bat and as notoriously churlish as ever with the ball. Never a big turner of the ball, the nature of the wickets seldom had a big effect on his figures. And he had the pluck to bat in all conditions. In the second Test at Kingston, against an attack comprising of Wes Hall, Charlie Stayers, Lance Gibbs and Sobers, Nadkarni scored an unbeaten 78 and 35. In the following Test, at Bridgetown, against a gallery of supreme stroke-players all at the peak of their powers, he bowled 67 overs, ending with 2 for 92. However, even by his severe standards, Nadkarni reached the zenith of his nagging metronomic accuracy at Madras in 1964, during the first Test of one of the drabbest series ever played. Faced with a big Indian total, on a turning pitch and plagued by illness and injury, the Englishmen decided on the ploy of stonewalling their way to guard the sick and ailing. Ken Barrington and Brian Bolus launched — if such a word can be used in this context — a partnership which would bring time to a stop, freeze the scoreboard and cast a pall of eternal ennui around the stadium and the land. Introduced towards the end of Day Two, Nadkarni bowled three maiden overs before stumps. The following day he rolled his arm over again and again. His deliveries were slow and flat, landing unerringly on the same spot. The two men could do little more than pat them back along the pitch. At the other end, Chandu Borde was bowling a tidy line as well. By the end of the first hour, lethargy had seeped into the veins of all the batsmen, fielders, spectators and — most of all — the scorers. Only the two bowlers kept coming in, briskly running the few steps and sending them down. Nadkarni bowled to a slip a short leg, with four men saving single on the off-side and three on the on. The first session saw him bowl 7 overs and concede 2 runs. If that was not all, after lunch, the game came to a virtual standstill. 27 were scored in the second session — 4 of them extras. Nadkarni’s second session analysis read 19-18-1-0. In the final one and half hours of the day, the scoring rate accelerated drastically. As many as 59 runs came at a rate that was positively rollicking in contrast. In the second session Barrington had finally scored a single off Nadkarni after 21 overs and 5 balls. According to The Times, he “was immediately taken off as though being altogether expensive.” He did not bowl in the third session. It created a new world record, breaking Horace Hazell’s feat of 17 consecutive maidens. The other champion cricketing miser, Hugh Tayfield, had more consecutive dot balls to his credit; but his 137 scoreless deliveries against England in 1956-57 had been bowled in 8-ball overs. Nadkarni’s figures at the end of the day read 29-26-3-0. When the match resumed after the rest day, Nadlkarni was criminally expensive in contrast, conceding as many as two runs from three overs, ending the innings with 32-27-5-0. The 5 singles he conceded had trickled in his 6th, 7th, 29th, 30th and 31st overs. In the final Test of that series, Nadkarni bowled 57 overs, yielding a surprisingly expensive 121 runs while picking up two wickets. England scored 559. Fred Titmus spun India into knots, with Nadkarni-like figures of 6 for 73 from 60 overs. What a joy those Tests must have been to behold! Nadkarni scored 52 not out as India were bowled out for 266. In the second innings, as India followed on, he was sent in at number three and saved the match with a seven hour knock of unbeaten 122, his only hundred in Test cricket. In the very next Test, at Madras in 1964-65, even as Garth McKenzie bowled Australia to a win, Nadkarni took 5 for 31 and 6 for 91. It remained his best haul in a Test, only 10-for of his career. He continued his purple patch with some handy scalps in the famous 2-wicket win in the next Test at Brabourne Stadium, as India chased down 256. But soon, with the emergence of a turbaned left-arm spinning wonder in the Indian scenario, Nadkarni had to give up his place in the national team. He continued to be as tidy as ever, but Bishan Singh Bedi was clearly a far more incisive bowler. Nadkarni was not taken to England in 1967, but returned to the side when Mansur Ali Khan Pataudi led India on the tour of Australia and New Zealand in 1967-68. In Australia he failed miserably with both bat and ball, as India lost 0-4. But, as the team travelled to New Zealand, he played all the four Tests alongside Bedi and EAS Prasanna. Both Bedi and Prasanna took more wickets, but Nadkarni headed the bowling averages with 14 wickets at 17.92, bowling 185.3 overs in that characteristic metronomic manner, conceding just 251 runs. His best moment came in the third Test at Auckland, when he bowled India to victory with a career-best 6 for 43 in the second innings. Nadkarni’s Test career amounted to 41 matches, with 88 wickets at 29.07 and that famous economy rate of 1.67. He also scored 1,414 runs at 25.70, with a hundred and 7 fifties. He was a colossal all-rounder at the domestic level, scoring 8880 runs at 40.36 with 14 hundreds, while with the ball he captured exactly 500 wickets at 21.37 apiece, with an economy rate of 1.64 runs for the over. His best outing was against Saurashtra for Maharashtra in 1957-58, when he amassed an unbeaten 201 and followed it up with figures of 6 for 17 and 3 for 38. His highest First-Class score of 283 not out came in his first season with Bombay, in the Ranji Trophy semi-finals against Delhi. Sadly, Bapu Nadkarni called it a day just as One-Day cricket was on the verge of making an entry into international cricket. One can only wonder at his probable feats in the shorter formats. And although he never played ODIs, he often makes it into the all-time Indian One-Day teams, with his name virtually the synonym for continuous maiden overs.